Hello! It's time for another JustRite Friday Challenge! This week's challenge (JRC_043) is to Show Support -- make a Sympathy or Friendship project. 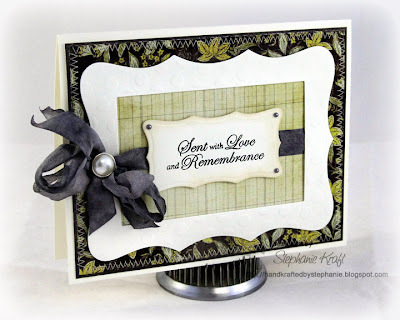 I opted to make a sympathy card using the newly release JustRite set, JB-09805 Sympathy Nested Sentiments & Verse. 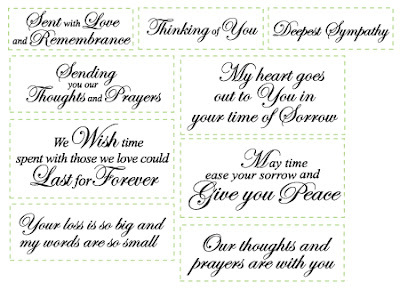 Sympathy cards are always hard for me to make, and I never seem to have one on hand when I need one. Though no words can truly express our sorrow during such a time, this set is a beautiful way to reach out to anyone who has suffered the loss of a loved one. I used the Spellbinders Polka Dot Frame Frameabilities -- I die cut the larger frame and popped it on top of some patterned paper from Pink Paislee (Queen Bee). I also die cut the smaller frame and instead of using the frame, I used the inner cut out to stamp my sentiment, "Sent with Love and Remembrance". I hope you have a wonderful weekend.. Thanks so much for stopping by! Accessories: Dyed seam binding ribbon, Basic Grey pearls, Pearl brad, Foam tape, Sewing machine and ivory thread. Simply elegant Stephanie! What great inspiration for this week's JR challenge! Very elegant! Love the beautiful ribbon.